Have you ever wondered about your family history? Have you ever wondered about your family history? Are you stuck on a particular ancestor? Now is the time to find some answers. 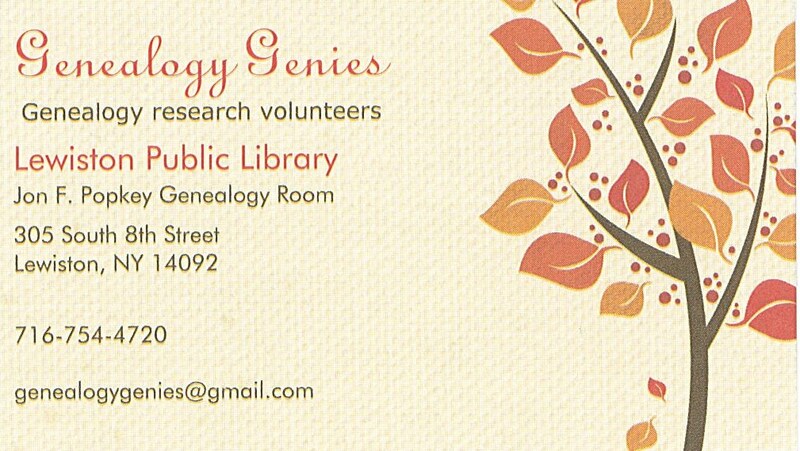 Lewiston’s new “Genealogy Genies” are happy to lend their expertise and to help you break down those brick walls. Where is my great great grandfather buried? What is my great grandmother’s maiden name? Who are my great great great grandparents? Who were all my grandfather’s brothers and sisters? Where in Italy are my grandparents from? What did my great grandmother die from? When did my ancestors first come to America? Did my great great great great great grandfather fight in the American Revolution? Where did my Uncle Joe live? will be postal fees and copy fees.